Orpheus was born inside a cave in Thrace, a region of Northern Greece. His parents were Oiagros, king of Thrace, and most probably the Muse Calliope. His brother was Linus, the Music teacher of the strong hero Heracles. Orpheus became famous in Ancient Greece for his poems and his music. According to the ancient poet Pindar, he was the "Father of the Songs". Orpheus' teacher was Apollo, the god of Music, who made him sing to his lyre in such an enchanting way, that he could set rocks and trees in motion. Some say that Orpheus invented the guitar and also the mysteries of Dionysus. Furthermore, Orpheus became famous for taking part in the Quest for the Golden Fleece as one of the Argonauts. Orpheus should never look around on his way up until he had arrived. But Orpheus didn't obey and, turning round, he caught a glipse of his beautiful wife to see if she was following indeed. All of a sudden, Eurydice dropped out of sight. According to Apollodorus, she was forced to return below and stay forever in the Underworld. Three years after the loss of his wife Eurydice, Orpheus was torn apart by the Maenads, the Nymphs of Dionysus, because he ignored their love. 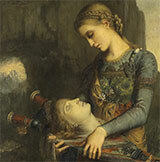 Orpheus was buried in the region of Pieria in Macedonia, Northern Greece.